View From The Porch: Breakup. It's not you, Lasergrip and Lightguard, it's me. I carried my M&P9 from the middle of 2011 until earlier this year. For almost that entire time, it sported both the Lasergrip and the Lightguard from Crimson Trace. I thought both were handier than a pocket on a shirt. I was obviously in a minority on the Lightguard. I found myself caught between two schools of thought: On one hand was the ALL THE LUMENS camp, who correctly pointed out that the Lightguard's modest 100-lumen output was barely SOME of the lumens and not even close to MOST of them. It didn't generate near enough light for "bounce" to illuminate a room. On the other hand was the camp who pointed out that most people don't go hunting for bad guys with a CCW pistol and therefore a weaponlight is unnecessary bulk and expense. 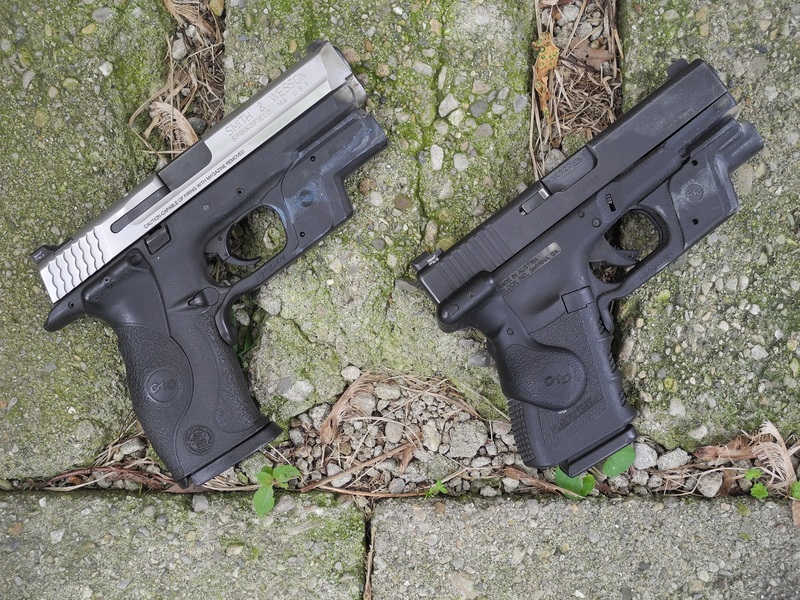 Nobody, however, could point out the downside to having something at which I'd already decided to shoot be a little better illuminated, and the Lightguard was reasonably priced and didn't make the pistol any longer or wider or harder to conceal. 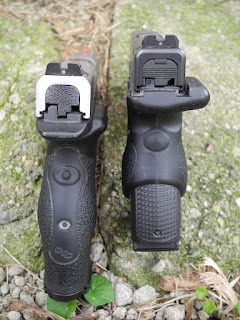 Unfortunately, when I switched to the Glock earlier this year, I discovered that the shape of the Glock Lightguard was not as friendly, especially during extended shooting sessions. By the end of the first day of the Contextual Handgun: Armed Parent/Guardian class in Topeka back in April, I had the worst case of "Glock Knuckle" I've ever had. I'm not normally susceptible to the malady, but with the addition of the Lightguard, the second knuckle on my shooting hand was slathered in Liquid Skin and wrapped in Bandaids by the end of the class. What made it annoying is that I've taken that M&P, complete with Lightguard, to multiple classes and it never caused any problems. The modest benefits accrued by the Lightguard aren't worth that. After five months, it looks like my Lightguard is coming off the Glock. Similarly, the Lasergrip. On the M&P, it's a no-brainer. 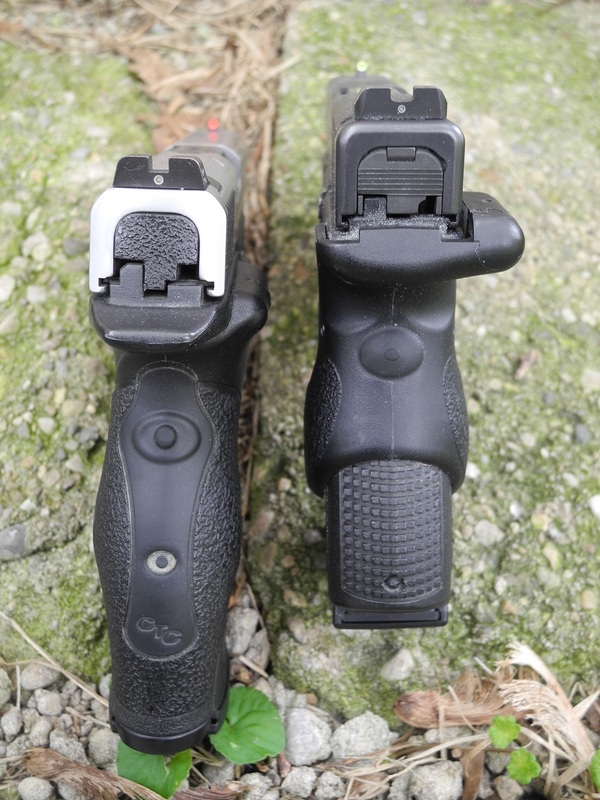 It simply replaces the pistol's factory backstrap, unobtrusively adding a laser for no increase in bulk at all. It's such a no-brainer that I'll admit being a little judgy of people who run M&Ps without one. So when I switched to the Glock 19, I ordered a Glock Lasergrip from Amazon. I didn't think anything about it until April, which was the first time I was having to reload the pistol on the clock and... holy cow did this thing complicate mag changes! Any benefit I'd gained from adding the Vickers mag release was negated by the fat battery saddlebag sitting right where my thumb needed to go to get to the release. So it's a reluctant goodbye to the LG-619, too. Ironically, Crimson Trace has just released a new product, the Laserguard Pro, which combines a light and laser into the footprint of the Lightguard. I'd put one of those things on my Glock 19 in a New York minute and figure out a way to mitigate the "Glock Knuckle" problem, but CTC is only going to offer them for the bitty little Glock 42/42 and not the normal-size Glock 19. Que sera, sera.